Chocolate, nuts, coconut, caramel - what doesn't this hand-held bar have? Our Chocolate Chunk, Coconut and Caramel Bars are packed with delicious layers - perfect to enjoy as a sweet treat with a glass of cold milk! Line 13x9-inch pan with foil, with ends of foil extending over sides of pan; spray with cooking spray. Combine flour and sugar in medium bowl. Cut in butter with pastry blender or 2 knives until mixture resembles coarse crumbs; press onto bottom of prepared pan. Bake 15 min. Sprinkle nuts and coconut over crust; cover with condensed milk. Bake 25 min. or until coconut is lightly browned. Cool completely. Microwave caramels and 2% milk in medium microwavable bowl on HIGH 2 min. or until caramels are completely melted and mixture is well blended, stirring after each minute. Drizzle over dessert; sprinkle with chocolate. Cool completely. Use foil handles to remove dessert from pan before cutting into bars to serve. 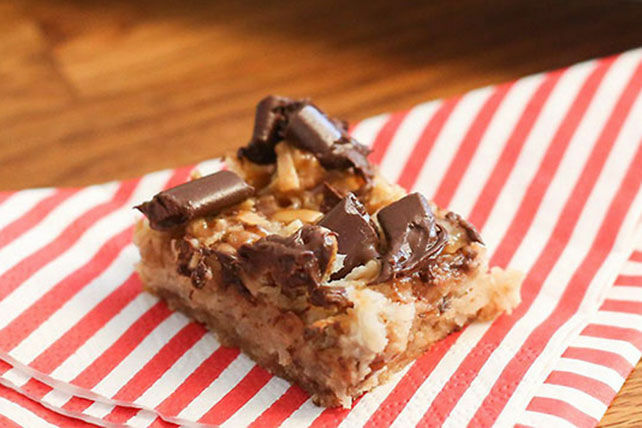 These delicious bars will go quickly at your next party. This recipe makes enough for a crowd of 36.